On November 18, 1761, the British war frigate H.M.S. Deptford sailed for the island of Barbados in the West Indies. On board was William Harrison, son of John Harrison, a horologist and clockmaker who was currently embroiled in a legal and technical spat with both the Crown and the Royal Observatory regarding the accurate calculation of longitude. Harrison carried with him a chronometer simply called the H4, a cumbersome piece of equipment encased in an airtight brass casing that was set to the Royal Observatory clock in Greenwich. He hoped to win the £25,000 Longitude Prize, reserved for those who could build a chronometer so accurate that it would lose an acceptable, albeit minimal, amount of time over the 15-month voyage to the West Indies. Harrison was finally recognized as the winner in 1773. He died in 1776, just one year after Captain James Cook returned from his second voyage of discovery. Captain Cook carried a modified version of Harrison's chronometers on board. A little over 20 years later, in March of 1818, an extensive array of architectural fragments arrived on English shores aboard H.M.S. Weymouth. The Weymouth’s crew sailed from Leptis Magna, an archaeological excavation site on the Libyan coast of North Africa. The shipment contained architectural fragments from Roman antiquity: 22 granite columns, 15 marble columns, 10 capitals, 25 pedestals, 7 loose slabs, 10 pieces of cornice, 5 inscribed slabs, and various fragments of sculptured figures (for example, “Statue in halves Head and Feet deficient”). These three episodes demonstrate an interesting trajectory of events mirroring contemporary developments in Enlightenment science and natural history. William Harrison's voyages to Barbados, as well as Méchain and Delambre's jaunt along the French meridian, exemplify one of the main characteristics of Enlightenment science in Western Europe: the ability to calculate, to rationalize the dimensions of space. Such experimentation was a necessary corollary to the mania for colonization, for the ability to measure space accurately expedited the process of dominium. Thus, for the crew of the H.M.S. Weymouth, an accurate chronometer would have to be indispensable to navigation, and by inference, to the proper securing of said architectural artifacts. And although the unloading of artifacts from the Weymouth’s hold brings us closer to the true purpose of this post, at this juncture, the achievements of late-Enlightenment scientists and natural historians are considered alongside the exploits of contemporary architects. Architecture and science are forms of cultural and intellectual expression whose coexistence suggests an intermingling of sources and inspirations. It can be thus argued that the scientist influences the architect and vice versa. These two realms share a commingling of circuitry: the spark of innovation crosses frequently between the two, creating a literal and figurative livewire of intellectual activity. 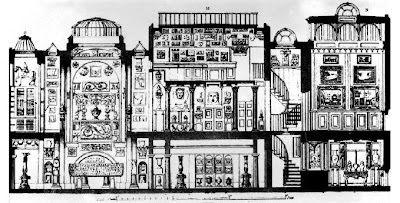 The work of the English architect John Soane (1753-1827) and his draughtsman/renderer, Joseph Michael Gandy (1771-1843), thus takes on a special significance. Although the two men only collaborated on a single project, some of Soane's work must necessarily be considered along Gandy's, for we know as much about Soane the celebrated architect through Gandy the struggling artist. When considering these two men, we look in particular to Gandy's rendering of Soane's Bank of England as well as his depiction of the interior spaces of Soane's house at Lincoln's Inn Fields. These works present an analog to what the explorers, cartographers, and collectors previously mentioned faced. The carrying of an H4 chronometer necessarily involved the carrying of a chronometer set to Greenwich Mean Time -- thus Harrison in Barbados carried a temporal fragment of England along his voyage. Méchain and Delambre likewise carried temporal fragments of Paris en route to Barcelona and Dunkirk. The crew of the H.M.S. Weymouth carried physical fragments of Leptis Magna to England. All show an obsession with the collection and depiction of artifacts. And to further elaborate the point, to demonstrate how architecture and natural science were part of a common intellectual milieu, this post thus aligns the work of Soane and Gandy with that of a contemporary French natural historian and scientist – Baron Georges Cuvier (1769-1832). As will be shown, Cuvier’s particular contributions to natural history give us a basic intellectual framework for a possible understanding of Soane’s and Gandy’s passion for collecting and depicting architectural fragments. Cuvier becomes of interest primarily because he is a contemporary of Soane's and Gandy's. The Baron Cuvier’s life and career mirrored Soane’s own in several ways. For example, Soane displayed a bust of Cuvier in his house at Lincoln’s Inn Fields. Soane was even knighted the same year that Cuvier was ennobled. Soane also alludes to the influence of Cuvier’s lecture style in his own Royal Academy Lectures. Cuvier's position as Professor of Comparative Anatomy mirrors Soane's position as Professor of Architecture at the Royal Academy, where he was curator of a collection dedicated to "comparative architecture." Inspired by Cuvier, Soane mentions the importance of comparative architecture at the close of his Lectures on Architecture, while Gandy, influenced by both Soane and Cuvier, would attempt an impossibly large treatise entitled "Comparative Architecture." But to further the objective of this post, this narrative introduces three specific innovations by Baron Cuvier: the notion of functional integration, the belief in cataclysmic extinction, and the idea of revolution as a vital geological events. These three intellectual innovations are considered insofar as they parallel the work of Soane and Gandy. [T]he component parts of each must be so arranged as to render possible the whole living being, not only with regard to itself, but to its surrounding relations, and the analysis of these conditions frequently leads to general laws, as demonstrable as those which are derived from calculation or experiment. Unlike subsequent natural historians, Cuvier did not believe in the evolution of species. For him, any change in an organism's anatomy would make it unable to survive. To support his claim that organisms did not evolve, Cuvier demonstrated that mummified remains of animals brought back from Egypt were no different from their living counterparts. Each organism being a functional whole meant that any change in one part would destroy the delicate balance of nature. Each part of an organism, no matter how small, thus bore signs of the whole. And this made the reconstruction of organisms from fragmentary remains (using rational principles) entirely possible. 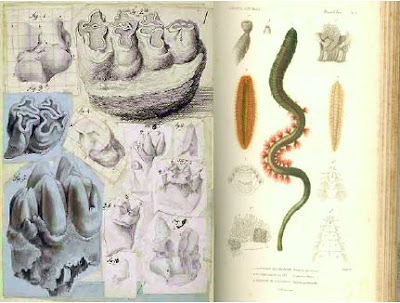 Cuvier became famous for his ability to "assemble" organisms from fossilized fragments. Yet this ability was not immune from controversy, as "he based his reconstructions less on rational principles than on his deep knowledge of comparative anatomy of living organisms." Archaeology is certainly most indispensably [sic] connected with [architecture], in order to familiarize the student with the models of antiquity, and to enable him to catch their spirit,and to emulate their principles of composition, whether generally, or with respect to details; and we may venture to affirm, that the more thoroughly the artists understands these, the less liable will he be to copy their beauties servilely, and to apply them indiscriminately; as he will at once be able to judge how far they ought to be modified, according to the peculiar circumstances of his own design. [T]he narrative of the tripartite section is organized from the light and Apollo in the Dome above, to the characters occupying the middle strata of the Museum, and finally to the Crypt and mortality below. This backdrop is essential, recalling at once the cycle of the rise, meridian, and setting of the sun, an important allegory derived from classical mythology. In conjunction with this tripartite structure, one must also keep in mind Chantrey’s bust of Soane, flanked by statuettes of Michelangelo and Raphael. Together, all elements combined suggest a true union of architecture, sculpture, and painting. 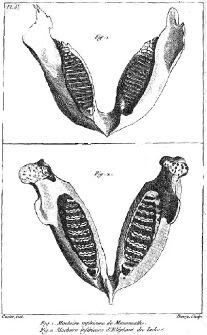 Cuvier went on to publish detailed studies proving that fossilized remains of African and Indian elephants were different from living elephant species, thus "proving" that the fossilized remains belonged to extinct animals. Using a similar analysis, Cuvier proved that the similar remains of other animals (the giant ground sloth, the Irish elk, the American mastodon, et cetera) were unrelated to living counterparts, and hence extinct. Soane's house-museum may also be read as an experiment in the picturesque on a microcosmic scale, further inspired by his memories of eighteenth-century Rome, and conceived of as a series of incremental ruined fragments within a precinct. This formal organization can be observed in both the plan of the Bank of England and in the poché plan of the Soane Museum, where discreet walled-in compounds relate to one another, displaying picturesque composition. The character of both plans suggest that they would look equally magnificent as ruins. We also look to the paintings of Caspar David Friedrich for inspiration. Whereas Gandy's commissions depict very little human activity, Friedrich's paintings depict an individual lost in the cosmos. Such examples suggest a nod to Cuvier's theory of extinction. As Cuvier predicted that no new species would be discovered, Gandy's painting of the Bank of England suggests that no further life will spring from this so-called idyllic landscape. How exactly did Cuvier account for extinction? He believed that the destruction of species was a result of periodic catastrophes (or "revolutions") that altered the Earth's shape and biomass. For him, these “revolutions” had not only natural causes, but presented a vital geological problem. Cuvier never associated periodic revolutions with events from the Bible. However, some later geologists, notably Rev. William Buckland in England, suggested that the most recent revolution was the Biblical Flood. This remained a popular hypothesis until Louis Agassiz (who had studied with Cuvier) showed that the "flood deposits" were actually formed by glaciers. We again look to Gandy's drawings for some corroboration of these developments. 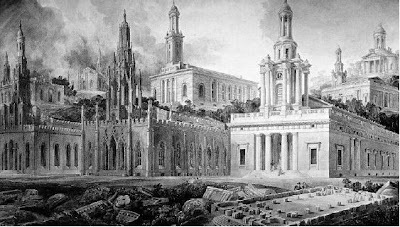 In particular, his drawing of Soane's London Commissioners' Churches suggests a periodic revolution, or catastrophe, and its immediate aftermath. In the picture, one set of ruins is strewn about, while another set obviously resembles a plan. With the ruins at the far bottom left of the pictures suggest a catastrophic event, our eyes move along the bottom and to the right, and seeing how he ruins reconstitute themselves into a plan. And thus we let our gaze follow the telemetry of the cathedral-like spires as they literally ascend in a sidereal drift. This post considered some of the work by Sir John Soane and Joseph Michael Gandy in relation to contemporary scientific developments. Three specific theories by the French natural historian Baron Georges Cuvier provided a basic intellectual framework from which the relationships between early 19th century English architecture and late Enlightenment science can be teased out. 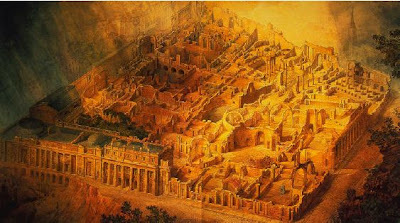 More specifically, Cuvier’s beliefs in functional integration, cataclysmic extinction, and periodic revolution are mirrored in Gandy’s renderings of Soane’s buildings. But the parallels between Cuvier, Soane and Gandy lead to further investigations. For example, Soane’s work may mark a transition between the exacting rationalization of late 18th century architecture and the picturesque romanticism of the 19 th century. Such a development can be inferred from contemporary science, as Cuvier’s theories marked an important transition from Enlightenment era natural history to the evolutionary biology and Darwinism in the mid-nineteenth century. There are many ways in which contemporary architecture and science partake in a unitary intellectual milieu, yet hopefully this post has demonstrated one of many possible ways to make such a connection. I really like the thread traced from specimen -> fossil -> ruin -> plan -> back to specimen. Makes me want to think some more about industrial architecture and urban decay, especially the way these show up in exploration/infiltration: always leading towards romanticism and analysis at the same time.